This degree covers the skills and knowledge that are required to be successful in the financial industry. Considerable emphasis is placed on key quantitative and analytical skills, as well as the importance of corporate finance and its subsequent governance, which remains at the cornerstone of modern finance debate and regulatory reform. On this course you’ll learn how to prepare, interpret and analyse financial information for a variety of users, as well as gaining an understanding of investment and finance. You’ll also gain a thorough grounding in accounting, financial theory and statistical methods for finance. Our academics are actively involved in research, with particular strengths in areas such as Fintech, high-frequency trading, corporate finance, portfolio theory and alternative investments. This means your learning will be informed by the latest findings and current sector issues. What distinguishes this course from many similar programmes offered at other universities is its flexibility; you’ll have the freedom to shape your course by choosing from a range of optional modules, such as alternative investments and Islamic finance, allowing you to broaden your knowledge and explore possible career paths. All students on a placement year – whether Home, EU or International - will pay 20% of their tuition fees during Year three, and continue to enjoy the support of the University throughout the year. 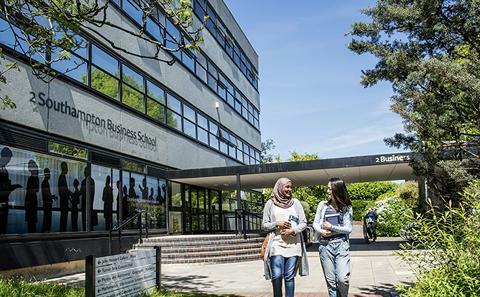 GCSE Southampton Business School requires all applicants to achieve at least a Grade 4 in English GCSE (taken in England) or a Grade C in English (where taken in Northern Ireland or Wales). Please note: Computing, Computer Studies, Product Design and Applied Business (single and double awards) are not considered to be restricted subjects. International Baccalaureate 36 points, 18 at higher level with 6 in Maths at higher level and 4/6 in English (depending on the syllabus (if no English qualification has already been achieved). We will consider other qualifications for BSc Finance, but please note that you must have an equivalent of Grade A in A-level Maths. Your application will be carefully considered and we will weigh up many factors – not only your academic achievements, interests and aptitudes, but also your motivation and your academic reference. We make our decisions in most cases on the UCAS form alone. Candidates who require special consideration (eg on grounds of age, disability or non-standard entry qualifications) may be invited for an interview. Books These can be purchased from any source. Some modules suggest reading texts as optional background reading. The library may hold copies of such texts, or alternatively you may wish to purchase your own copies. Although not essential reading, you may benefit from the additional reading materials for the module. Other Approved calculators: Candidates may use calculators in the examination room only as specified by the University and as permitted by the rubric of individual examination papers. The University approved models are Casio FX-570 and Casio FX-85GT Plus. These may be purchased from any source and no longer need to carry the University logo.